In the early days of the project I concentrated my attention on the community side and worked on the holons idea for a distributed physical infrastructure. For the past few months I’ve been contemplating what the next project step(s) should be and how we can create favorable conditions for a thriving community and ecosystem of smart contracts. In this post I will propose an experiment for the Ethereum community – in a way, returning to the things I wanted to work on in the beginning of the project. The main idea behind this experiment is the making of a self organizing knowledge sharing network with potential ramifications in a variety of other areas. We’ll explore a few of the use cases towards the end of the article, but only in order to provide a starting point in this exploration - not to box it. As does any successful idea, the Ethereum Project has metamorphosed many times and evolved into what it has become today. 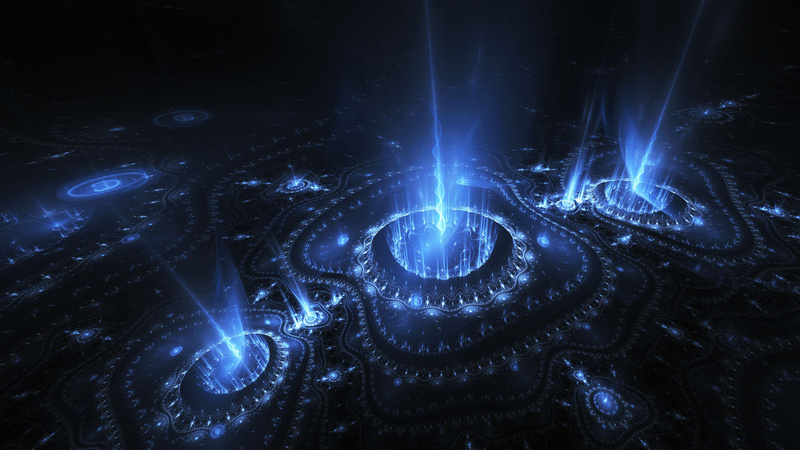 The growth happened in various ways while the available resources were channeled into strategic areas. In the beginning a big part of the focus was put into legal hacking and the creation of the required infrastructure to make the Genesis Sale happen. As we made our way through the legal bushes, getting to the point where we felt comfortable with the setup, the focus shifted towards the security and monitoring of the entire Genesis Sale operation. Before turning the Genesis Sale switch on, we had in-depth security audits and created an entire DDoS protection strategy with multiple layers and courses of action. As we approached the end of the Genesis Sale, as expected, the focus shifted mainly towards the development of the platform. After months of intense development, now the focus is shifting towards the immediate genesis launch, smoothing the rough edges and auditing the software in order to expose any security flaws that might have escaped us. Soon, we will have Ethereum released and all attention will go towards monitoring how it behaves “in the wild”. Now the question is, what happens after it’s “out there”? What is the next phase of the project and what should we do now to prepare for it? The education aspect is regarded by everyone in the project as extremely important in both the short term and long term, especially since one of the points of this platform is the creation of a rich ecosystem of DAPPs, DAOs and other smart-contracts living on it. Everyone agrees that in order to have a thriving ecosystem, we need to create favorable conditions for curious developers to play and experiment with Ethereum. That also means providing the right tools, resources and tutorials – in short, making it as easy as possible for interested people to learn, collaborate and share knowledge. While exploring the idea behind educational portals (i.e. Code Academy) and researching into the effectiveness of different approaches, I stumbled upon a study on students taking online courses. According to this study, the students in massive open online courses are apt to take a passive approach to learning, avoiding collaboration with others, seeking only passing grades, and therefore not retaining new knowledge. Even if in the beginning the students were motivated by acquiring new skills, as they progressed through the courses their focus shifted towards the grades and the completion of the course. Following this rather disappointing result, the researchers suggested that when planning online courses, providers should develop engaging coursework that requires immediate peer interaction and use of new knowledge. This led me to the thinking that for something as radically new as Ethereum, maybe looking for new approaches to education and collaboration could be key to unlocking the potential present in the already formed Ethereum community. After experimenting with a few approaches, the idea behind the Ethereum Builders project started taking shape. As a project, it is formed from multiple components, but in this post I will focus only on the education area. By combining screensharing, an open source upvoting interface and Bitcoin, we create a way for the Ethereum open source, knowledge-sharing economy to self-organize, self-sustain and distribute information towards the edges with maximum impact at virtually zero cost. Special thanks goes to Linda from Code Buddies for hacking this together and to Aurel Iancu for the invaluable help. Because of lack of a better option, Google Hangouts with screensharing will be used as the interactive medium for the Ethereum sessions. The web interface is an open source upvoting system, in this case used as a peer-to-peer self-organizing knowledge-sharing network. Bitcoin (and soon ETH) can serve as a tipping/donation mechanism for the course/hackathon organizers – tokens of appreciation for the invaluable shared knowledge. If the quality of the sessions is good, the screensharing hangouts could also be recorded and used for video tutorials and other educational content quite easily. For documentation and guides, GitBook seems like an interesting option. With it you can pull content directly from wiki pages that live on different repos (i.e. ethereum wiki, cpp wiki, go wiki, etc.) and display it in a nice web UI or ebook format. By pulling content from the wikis, whenever the documentation is updated the GitBook automatically updates as well. All in all it looks to be a good fit for what we need at the moment, since the documentation evolves at such a rapid pace in Ethereum world. You can see the initial guide we hacked together here. Again, this just an experiment and we’ll be playing with a few of these things in the coming weeks to see what works and what doesn’t. So please be patient if something doesn’t work as expected and report it by opening an issue. Ethereum reputation system for the code whisperers, participants, builders, etc. You will only be remembered for two things: the problems you solve and the ones you create. 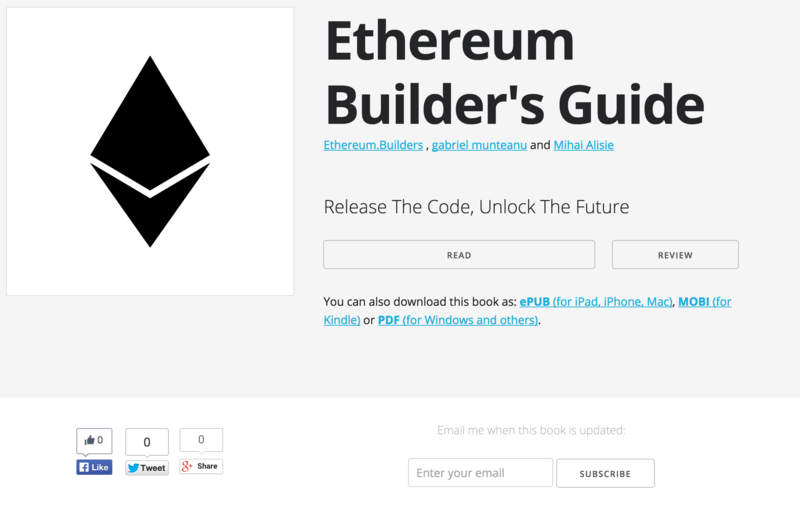 In the current form, ethereum.builders is an open-ended tool that enables the Ethereum community to coordinate, collaborate and share knowledge. The users will most likely discover new ways to use it on things that we haven’t figured out yet. That being said, I’d like to walk through a few use cases in order to provide a starting point in this journey. 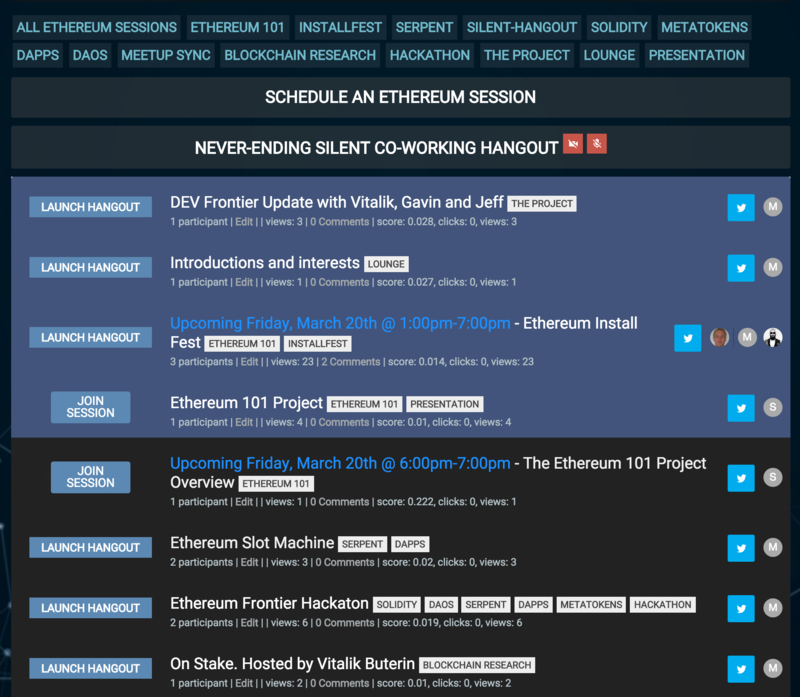 Think of Twitch, but for Ethereum hacking. Instead of watching other people playing games, you can watch people create awesome things on Ethereum, and pick up new skills and knowledge along the way. From learning how to install an ethereum client on your machine to making your first DAPP and showcasing it there’s an entire variety of interactions that can be explored. Organize the information and make it easily accessible. Currently the Ethereum knowledge base is fragmented between various repo wikis, forums and blog posts. As an alternative to this madness, I propose GitBook as a tool for organizing information and making it accessible in web, pdf, mobi and epub format. We’ve dreamt about organizing a distributed global hackathon for a while now. Now we have a way to do it. Not only can we organize it, but at the same time, thanks to the Hangouts On Air feature, we can broadcast the event live on YouTube. If you’re interested in participating or sponsoring an event like this, please get in touch. Besides organizing hackathons, the hangouts can also serve as global co-working space(s). You can think of it like having a place where you can go and work on building cool things on Ethereum together with other people from all around the world. The energy builds up when working together. Use the available channels to reach the minds interested in researching the possibilities and problems that blockchain technology has. Make it simple for these people to coordinate and exchange ideas in a highly interactive format. The rest is up to them. Besides the blog this could serve as an interactive channel of communication with the community and the developers swarming around the project. They’re not mutually exclusive tools but rather complementing each other. Physically - with meetups.com decision to start to charging meet up organizers depending on the size of the group, some have already started looking for a replacement. Online - By design you remove the bottlenecks as in having “X” to organize a meetup call in a closed Skype room with only a few select members. Open the gates and allow the communities and their members to interact, get to know each other and synchronize. Think of it as a meta layer that goes on top of physical meetups, allowing the local communities to become part of bigger communities (continental, worldwide, etc.). *Some of the above sessions are just examples.